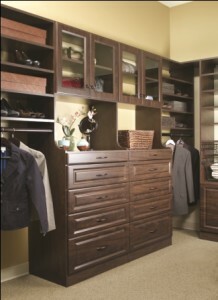 Designing custom closets isn’t just for architects and contractors. More Space Place Fort Myers makes it easy to create your own organizational solutions. Whether you have a record-breaking high heel collection and need cubbies or shoe fences to keep them off your closet floor, or you need space to hang all your professional clothes so that they’re easily accessible every morning, we’ve got you covered. More Space Place Fort Myers is different than big-box stores and online vendors because we don’t just give you a generic, one-size-fits-all closet system and then stick you with the headache of a complicated installation. We take custom measurements, evaluate your organizational goals, and suggest modular components so that your personalized closet can change as your needs change. Plus, our vast selection of accessories, styles, and finishes means our custom closets can truly be tailored to reflect your aesthetic and your lifestyle. At More Space Place, we’re always ready to put the fun back in FUNctional by showing our customers how easy it is to create functional, space-saving furniture for their entire home. Stop by our showroom at 14680 Tamiami Trail S. in Fort Myers or contact us today to learn more about custom closets, Murphy beds, office furniture, or any of our other options for unleashing your home’s hidden potential. We proudly serve customers in Fort Myers, Cape Coral, Sanibel, Bonita Springs, Matlacha, Pine Island, Estero, and all of the surrounding communities.